Southern Rhodesia - Alerting Evans of an alteration in John Grierson's itinerary. 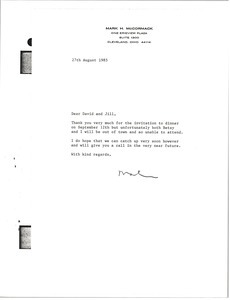 McCormack notes the importance of finding long-term real estate investments in both South Africa and Rhodesia. 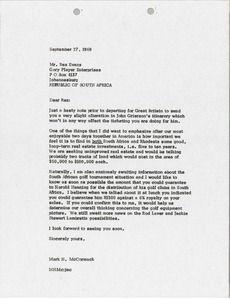 McCormack declines the dinner invitation. 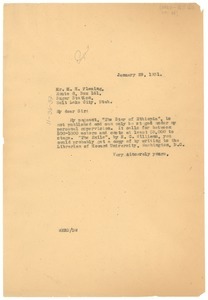 New York (N.Y.) - Addressed to M. H. Fleming; in answer to his correspondence inquiring into "The Star of Ethiopia," informing him that the work can only be produced under his "personal supervision," requires "between 500-100 actors, and costs $5,000 to stage." 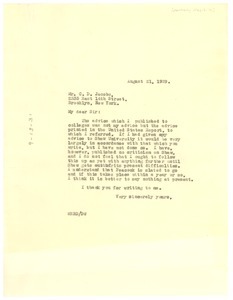 Referring him to Howard University Library to attain a copy of E. C. Williams's "The Exile." 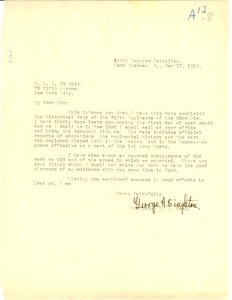 Camp Sherman (Ohio) - Concerning material on the 317th Engineers of the 92nd Division of the United States Army for Du Bois's history of African American troops during World War I.
San Rafael (Calif.) - A personal account of Spencer's experience since last writing to Du Bois. 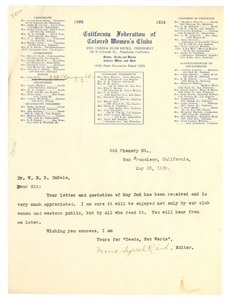 Mentions the Century Club of San Francisco. 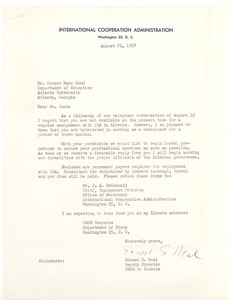 Washington (D.C.) - Concerning academic and professional perceptions of Charles S. Rice. 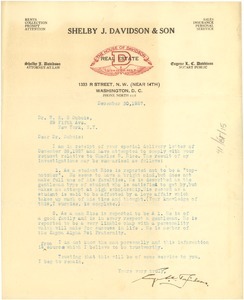 Signed by Eugene L. C. Davidson, Notary Public for Shelby J. Davidson & Son, Real Estate. Atlanta (Ga.) - Regarding a list of documents to be returned. 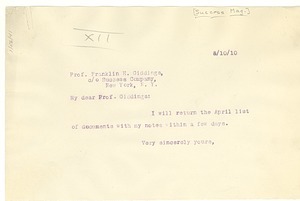 Addressing Franklin H. Giddings, Editor of Success Magazine and Professor of Sociology and the History of Civilization at Columbia University. New York (N.Y.) - Defending the arguments of his recent editorial (as challenged in mums312-b182-i223) and clarifying the advice therein offered to African American colleges. 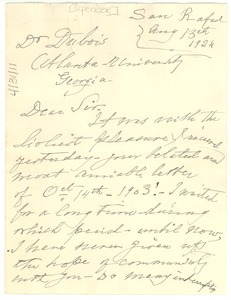 San Francisco (Calif.) - Concerning quotation received from Du Bois for use in the club's journal.